Ychtis finished up their visit at Corpus Christi on Friday night with a concert in front of close to 200 people. EILEEN BUCKLEY – BUFFALO, NY (2008-07-25) An award-winning all girls choir and dance group from Poland is visiting the United States for the first time. 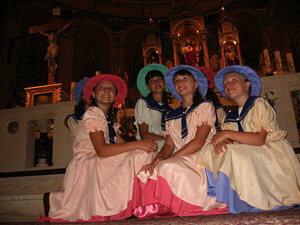 They will be performing Friday evening at Corpus Christi Church on Clark Street in Buffalo. WBFO’S Eileen Buckley caught up with the Polish girls’ choir to learn more about their performance tour. Corpus Christi Parish Council President Andy Golebiowski took these photos while Ychtis was performing during and after 11:30 am Mass. The 7 girls range in age from 9-13 years of age. The people of Ychtis provide them with a positive alternative to a difficult family life by engaging them in education through music. The group’s presence is a wonderful opportunity for Buffalo. Earlier they performed in Chicago, London, Ont., St. Catharines. From Buffalo they will perform in New Jersey and Doylestown, PA.
Ychtis will perform again tonight here at Corpus Christi starting at 7 pm.